Player collectors are a passionate bunch. 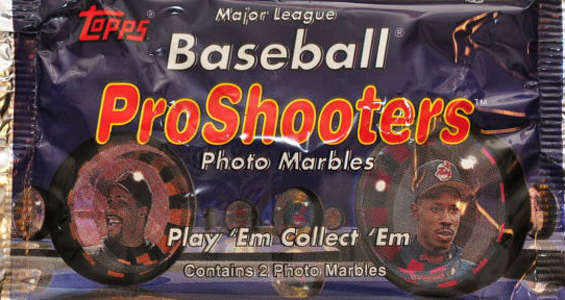 That's one of the only way to explain the prices of 1997 Topps ProShooters Marbles. A rare test issue that is believed to have been distributed only in a small part of Canada and possibly into the United States, these oddball baseball pieces rarely pop up. 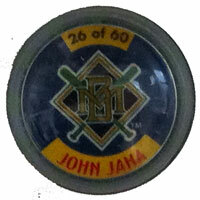 One side of the plastic-encased marble has a picture of the player's face. The back has their name, team logo and set number. Around the middle, the marbles are sealed with a black plastic band. 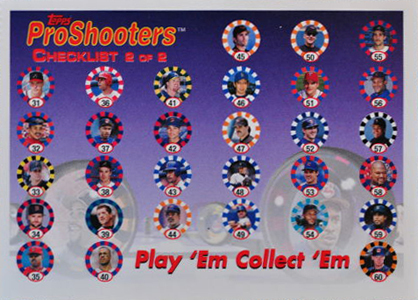 In all, 60 players make up the set, including many of the most widely collected players from the era. The 1" marbles came two to a pack. Just as collectible, if not more so, are the two checklists. Each has the names and photos of 30 players. Among the toughest cards to find for modern player collectors, these checklists skyrocket in price on the rare occasions that they pop up. A big reason is because so many player collectors are competing with each other. Not only are the passionate Ken Griffey Jr. collectors chasing Checklist 1, but so are the Barry Bonds, Jose Canseco and Derek Jeter collectors. 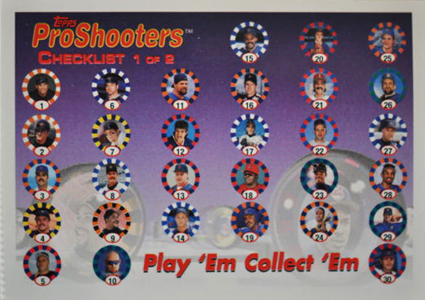 So little is known about this set that it is unknown how the checklists were distributed, whether they were one per pack or less frequently. It is likely that most were simply tossed out, further fueling their rarity and popularity among player and oddball collectors.